At the same time, I’d like to allow a situation where there will be no labels assigned to a category when there are not enough products to justify it. and handle all logic and checking for anomalies in the application? I’m assuming that users won’t have direct access to the database. For those interested in an in-depth conversation about the business context at hand, you can visit this chat room. Note: This answer presents an approach to cover specifically the business rules derived by way of the earliest series of comment and chat interactions (most of which can be seen in this question revision). Nevertheless, after more in-depth clarifications and deliberations took place, @yemet indicated that the business context may require a somewhat distinct method, due to the successive identification of dfferent business rules. The fact that you have determined that there exists a three-way association (also known as ternary or diamond shaped relationship) that involves the entity types (tables once implemented) of interest shows that you are heading in the right direction. Which implies the existence of an associative entity type that I am going to call product_category. Situation that suggests that there is another associative entity type, in this case the one that I will name category_label. As noted, I have included a new entity type that I denominated label_assignment but, naturally, you may name it using a term that is more meaningful with respect to your business domain. Each product has to first be related to a certain category before it receives a label assignment. A label cannot be assigned to a particular product if it has not been connected to a certain category previously. A product can be related to a certain category without having to be involved in a relationship with a label. -- depending on your business context characteristics. -- your preferred (or required) naming conventions. CONSTRAINT AK_product_code        UNIQUE      (product_code), -- (Possible?) ALTERNATE KEY. CONSTRAINT AK_product_name        UNIQUE      (name),         -- ALTERNATE KEY. CONSTRAINT AK_product_description UNIQUE      (description)   -- ALTERNATE KEY. parent_category_number  INT      NULL, -- Set up as ‘NULLable’, in order to focus on the main aspects of the approach exposed. CONSTRAINT AK_category_name                    UNIQUE      (name),        -- ALTERNATE KEY. CONSTRAINT AK_category_description             UNIQUE      (description), -- ALTERNATE KEY. CONSTRAINT AK_label_name        UNIQUE      (name),       -- ALTERNATE KEY. CONSTRAINT AK_label_description UNIQUE      (description) -- ALTERNATE KEY. CREATE TABLE product_category -- Associative table. CREATE TABLE category_label -- Associative table. CREATE TABLE label_assignment -- Associative table that ‘concretizes’ a relationship between two distinct relationships. CONSTRAINT PK_label_assignment                          PRIMARY KEY (product_id, category_number, label_number), -- Composite PRIMARY KEY. CONSTRAINT FK_FROM_label_assignment_TO_product_category FOREIGN KEY (product_id, category_number)   -- Composite FOREIGN KEY. CONSTRAINT FK_FROM_label_assignment_TO_category_label   FOREIGN KEY (category_number, label_number) -- Composite FOREIGN KEY. Pay especial attention to the two composite FOREIGN KEY definitions of the label_assignment table, because the category_number attribute is included in both of them. A product has to be assigned to category in order to be visible in the shop. Therefore, you should guarantee that each time that you INSERT a product row you as well link it with a certain category by means of the INSERTion of a row in the associative table here called product_category. In this way, both operations should be executed within the same ACID TRANSACTION, so that they either succeed or fail as a single unit. Many to Many and Weak Entities. 1. Integration Definition for Information Modeling (IDEF1X) is a highly recommendable data modeling technique that was established as a standard in december 1993 by the United States National Institute of Standards and Technology (NIST). 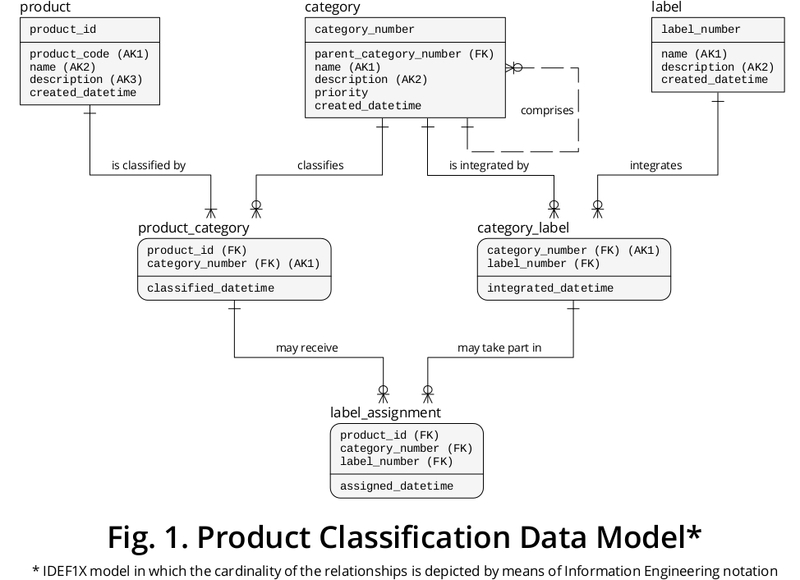 It is solidly based on (a) theoretical work authored by the originator of the Relational Model, i.e., Dr. E. F. Codd; on (b) the Entity-Relationship view, developed by Dr. P. P. Chen; and also on (c) the Logical Database Design Technique, created by Robert G. Brown. It is worth noting that IDEF1X was formalized by way of first-order logic. Not the answer you're looking for? Browse other questions tagged mysql database-design foreign-key primary-key many-to-many or ask your own question. How can I model an ERD with relationships that include “this or that but not both” and “this and that”? How to model product part selection with restrictive rules?